Ah, the sticky label. A humble invention that is truly versatile. In fact, the sticky label is a great way to personalise cards, presents and party favours. They can be a crucial tool in your work life; increasing office productivity, competent organising and brand awareness. But why be like everyone else and go for bog-standard white sticky labels? Why not stand out from the crowd, make a statement, be impactful and design your own coloured labels? With plenty of benefits, you’ll wonder why you never did before! Designing your own sticky labels is a great way to be more inventive when thinking about cards and presents for loved ones. With Christmas coming around before we know it, a great idea is to design your own present and card labels. Why not have sticky labels made with a picture of you and your family on it, your pets, or simply your family’s names? It’s a great way to make present and card labelling faster and more fun! All you’ll have left to do is write the name of the recipient on the label or the name of the name of the intended for the card. A personalised gift sticker is bound to put a smile on your loved one’s faces and will come in handy for special occasions for years to come! Another great idea is to design a reel of pretty, coloured labels with your house address on them. 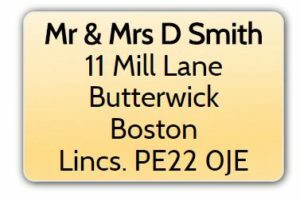 A lovely idea is to add a sticker of your address inside every card you send. This way, the recipient will always have your address to hand. You could even send your nearest and dearest a few in their card to save them writing your address in the future – particularly if it’s a lengthy one! What could be more special on your wedding day than giving someone a little reminder of the day with a treasured picture or message on it. Designing sticky labels is a great way to do this! Simply think of a message, quote or memory that’s personal to you, or perhaps a picture of the bride and groom when they were younger, and stick on everyone’s wedding favours. Your guests will appreciate the personal touch and it’s a great way to ignite memories that will enhance your special day. Not every company is lucky enough to have its own space. If your company does share an office space with others, having professional looking sticky labels made up is a great way to clearly label what’s yours without scrawling on things with biros and tippex (which looks unprofessional). 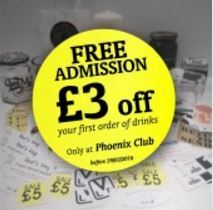 Simply design your sticky labels, adding your brand logo for extra kudos, and use them to differentiate what’s yours. It’s a great way to keep on top of your assets, meaning things are less likely to be borrowed, lost and replaced. There is nothing more satisfying than having a really organised workspace. When you’re desperately scrabbling around for a hole punch, stapler or plastic folder, having a place for everything and everything in its place massively increases workflow and productivity. In order to cement your office as an elite, professional environment, designing coloured sticky labels is a must. Gone are the days when plain white labels with messy handwriting were acceptable. Use your company logo or brand colours to design labels that will come in useful when labelling those various stationary cupboards. If your company sends a lot of mail, a great way to make sure that your letters make more of an impact is to design coloured labels. When people pick up their post, plain white envelopes look pretty boring, with people usually assuming their junk mail or bills. To make your company stand out from the crowd, try designing coloured address labels that have your company brand on them logo on them. Straight away, your letters will catch their eyes, meaning they’re less likely to ignore them. Use your company logo to increase brand awareness and establish yourself as a professional, leading company. If your company is relatively new, establishing yourself as a brand is half of the challenge. What could be more fun than going online and designing a reel of coloured labels that incorporate your logo or branding to stick on everything and anything you can. 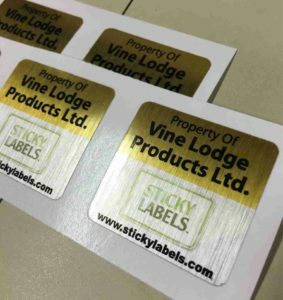 Whether you make your own soaps and are looking for stickers to give them identity, or want to use the stickers to put on paper bags, to make them look your own, personalised sticky labels are a cheap and easy way of getting your branding into every tiny aspect of your company, preventing the need (and cost) of getting other elements branded.